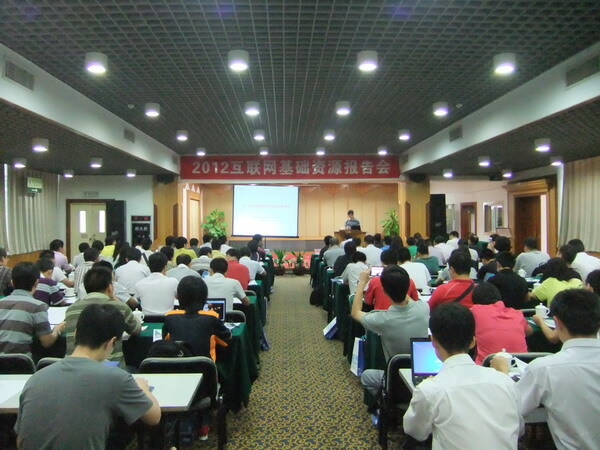 On the afternoon of July 24, 2012, Guangzhou of Guangdong Province successfully played host to the “Symposiuma on Internet Infrastructure Resources 2012 – Guangzhou Session” which was co-sponsored by China Internet Network Information Center (CNNIC) and Guangdong Internet Society. Leaders from the Communication Administration of Guangdong Province and Guangdong Internet Society, some members of Guangdong Internet Society and members from Guangdong Province of CNNIC IP Address Allocation Alliance, as well as registries in Guangdong Province gathered for the symposium and communicated and discussed with each other with regards to the current development of internet resources, particularly the grave shortage of IP Addresses. As is stated on the symposium, the number of Chinese netizens has reached 538 million, and the application of Internet in such areas as information, entertainment, and business has permeated into every aspect of economy, politics and culture. Nevertheless, Internet infrastructure resources including IPv4 Address, AS Number and domain name, etc. constitute the cornerstone bearing in support of all the aforesaid applications. Nowadays, China suffers from an acute shortage of IPv4 addresses and the overall transition from IPv4 to IPv6 poses a fundamental challenge that calls for solution to the development of the next generation Internet. The transition to IPv6 is a complicated and systematic project. At present, many organizations engaged in the Internet industry are far from being prepared, lacking the skills and capacity for the transition to IPv6. Experts from CNNIC gave an introduction to the status quo and the latest application policies of IPv4 address resources, and explained how to apply for Internet infrastructure resources including IPv4 Address, AS Number and domain name, etc. via CNNIC IP Address Allocation Alliance. The experts urged those organizations engaged in the Internet industry but without their own IPv4 Address to take advantage of the opportunity and apply for the last /22 IPv4 Addresses as soon as possible so as to facilitate the transition to IPv6. As early as March 3, 2010, CNNIC launched the “Program of Fast Access to IPv6 Address Application”, namely, the members of CNNIC IP Address Allocation Alliance can apply for a portable IPv6 Address quickly and free of charge via CNNIC with a view to encouraging domestic enterprises to plan and apply for more IPv6 Addresses. Meanwhile, the experts also briefed on the reliable server certificates developed by CNNIC which aims to ensure the safety of the Internet of China. Experts from China Telecom Guangdong Research Institute shared the development trend and prospect of the next generation Internet. Professors from Beijing University of Posts and Telecommunications provided the participants with IPv6 technical training free of charge.